Sansara Stinson, Shamanic Healer, Reiki Master Teacher, MSW, comes from the perspective that we are our own best healers, and to help make self-healing techniques more accessible, she teaches various 101 workshops though exultation. These classes include topics on restorative justice, practical self-care, learning tarot, how to use a pendulum, smudging with sage, and more. The workshops enable individuals to have more tools easily at hand to find peace and exultation in their own lives. Sansara also teaches Reiki, levels I, II, Master and Teacher through individualized classes. These may be tailored individually or taught in a group cohort settings. As Sansara is a shamanic healer that practices Usui Reiki Ryoho, her classes include additional information on the chakra system, energetic shielding, communication with one's soul using a pendulum technique, and more. 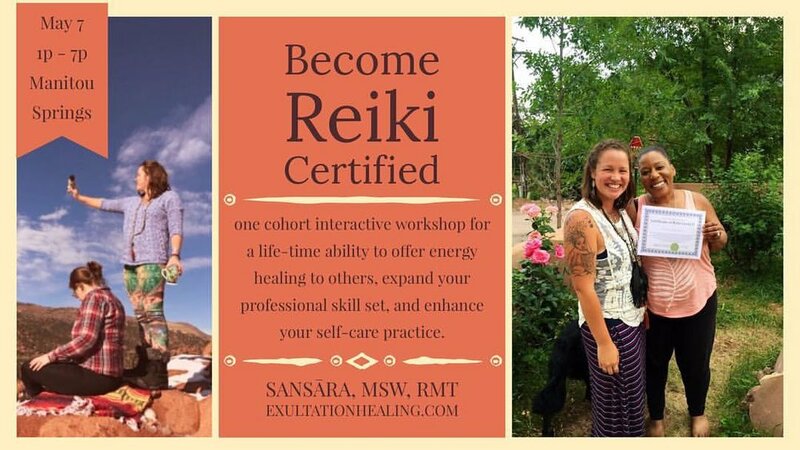 Currently, Sansara offers Reiki 1 & 2 Certificate and Attunement in a 6-hour workshop on a sliding scale price point of $289 - 425, to include a gifted crystal pendulum and personal journal. Reiki Master level and Reiki Master Teacher level are taught separately in 5-hour workshop classes at a sliding scale price of $375 - $575. A combined Reiki Master/Teacher class can be discussed on an individual basis.